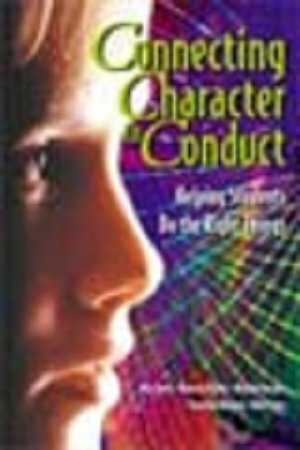 Howard T Herber Middle School has begun a character education initiative based on the Association for Supervision and Curriculum Development's (ASCD) book Connecting Character to Conduct. co-written by Richard Banyon, Malverne's Assistant Superintendent for Curriculum & Instruction, the book is an outgrowth of a doctoral thesis presented at Columbia Teachers College on the moral development of middle school students. feelings of being "left out"
These results were shared and discussed with other educators, and it was agreed that a practical, positive approach was needed to help all students make sound decisions now and in the future. "Our students feel pressured to make the right decisions in school and in the rest of their lives, and they don't know how," said Mr. Banyon. "They need the time and opportunity to develop character and conduct that demonstrates respect, impule control, compassion and equity. These guiding principles are to be aligned with out teaching, counseling and discipline practices." Howard T. Herber Middle School is using the Connecting Character to Conduct all-inclusive approach that will help the school achieve its mission in adopting the guiding principles of respect, impulse control, compassion and equity (RICE) as the foundation for daily life. Unlike add-on programs or special courses, the program integrates these principles into the existing curriculum, discipline program, counseling services and the entire normative structure of the school. The HTH staff is using the principles of character and conduct to make the school safer, better disciplined and a more welcoming place to learn and work. The RICE principles help sustain the high expectations and academic focus at HTH, despite competing pressures. during a Character and Conduct workshop held in the beginning of the year, the entire faculty and staff worked together to develop a schoolwide program to align their teaching, disciplinary and counseling practices. this program includes individual plans for classroom teachers, administrators, pupil personnel and other school staff to follow. All the members of the school, including our student, use the RICE principles to define and fulfill their roles within the school settting. parents and children use guiding principles to make positive connections between character and conduct at home and at school. Whe parents see the value of the RICE principles as their children practice them in the school setting, they tend to use similar strategies to create a home-based culture that supports learning within their own family traditions. this positive link creates continuity between a student's home life and school life, therby encouraging student to make the right decisions for the right reasons. "Our focus here at HTH is the intellectual development and academic achievement of all students, and the personal and social development of each student," said Principal Steven Gilhuley. "We encourage everyone to support the efforts of our students and faculty, and to help our student to learn well, stay safe, participate and graduate."